Robyn of Have Dogs, Will Travel asked if I was planning to put a demonstration of this technique on my blog - and I'm having so much fun making these journals that I quickly said "yes." I like to look for old books that are a specific size. The most important thing for me is the price and condition of the cover, but I also love one with illustrations and an interesting theme. Most of the books I have are more than 50 years old - and they cost $1-2. They are on the final sale cart and will be discarded if not sold. I love giving them a new life. I first learned about recycling books as journals from Jan of ...In My Spare Time and loved how she used the theme of her book to match the destination of her travel to Provence. 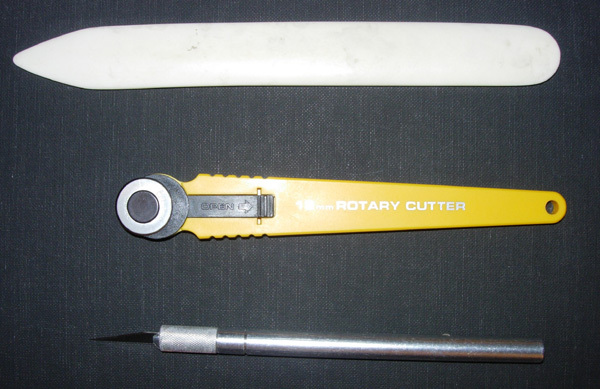 From Top to bottom - a bone folder to press folds and to smooth the paper onto a surface when gluing; an 18mm Olfa rotary cutter that I use for cutting the watercolor paper and the end papers; a craft knife for removing the original text block from the book. Step 1. 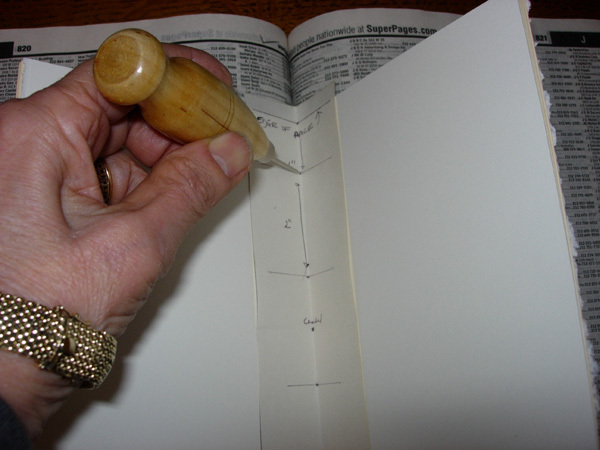 Carefully remove the original text block using a craft knife to cut through the fold between the block and the end paper. I look for books that are made of multiple signatures that are not glued directly to the spine. This is what the book cover looks like after the block has been removed. I mistakenly sliced into the spine book cloth recently and had to reinforce it by gluing on a piece of muslin to strengthen it. This is a photo of the inside of the cover after the muslin was attached and the outside of the cover to show the repair. This is the book that will be photographed in the remainder of these entries. I love it and was upset with my carelessness. Carefully pick apart the original signatures from the book in order to obtain one folio for a pattern for cutting the watercolor paper. I also always save the title page to include in my new journal and select illustrations. 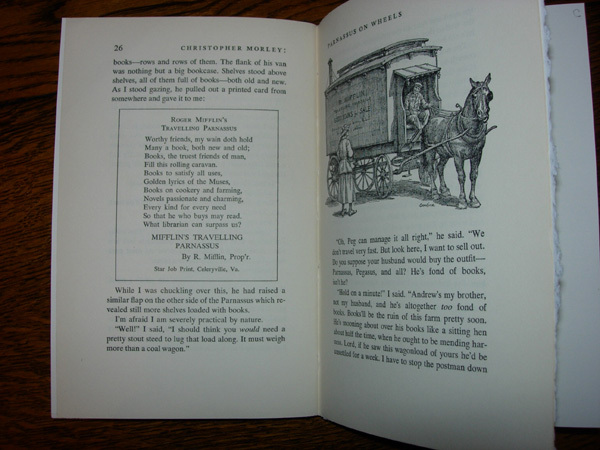 This is a folio from Parnassus on Wheels by Christopher Morley. It was the pattern that I used to cut watercolor paper with a metal ruler, the Olfa rotary cutter, and a self-sealing mat. 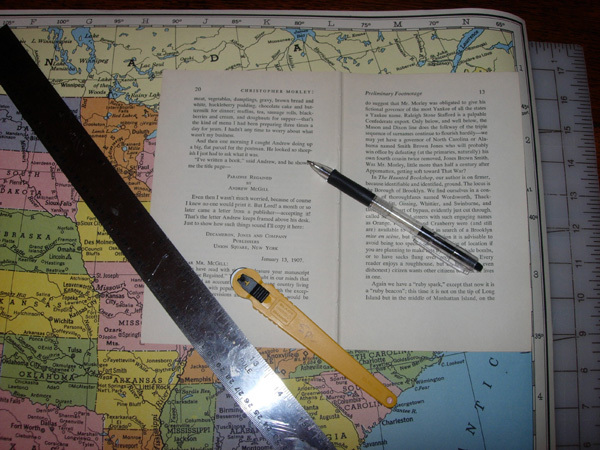 I discovered that the metal ruler was essential as I sliced a few of my plastic ones. I also prefer the rotary cutter to a craft knife. I used 140 lb. watercolor paper for the folios and made 5 signatures for this book. 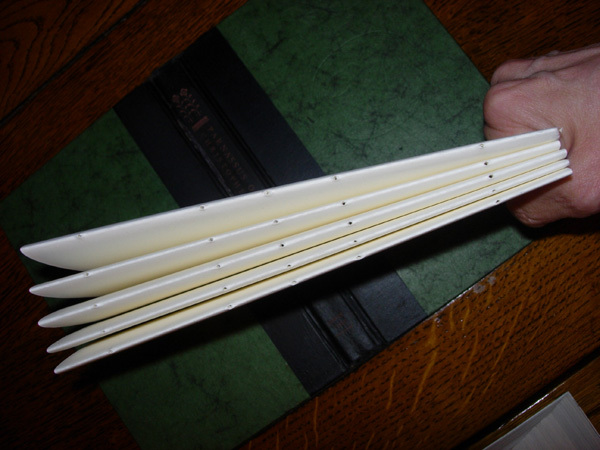 As I folded each folio, I pressed the fold with my bone folder and then decided how many folios I could put into each signature and how many signatures fit into the original spine area. The method that I use to stitch the signatures together is outlined with illustrations by Martha of Trumpetvine Travels. She inserts watercolor paper into small Moleskine journals, but told me I could still use 5 holes for the stitching in my larger format books. I make a punching guide from a piece of card stock, making the first hole one inch from each end, a third hole in the middle, and the two remaining holes somewhere in-between. 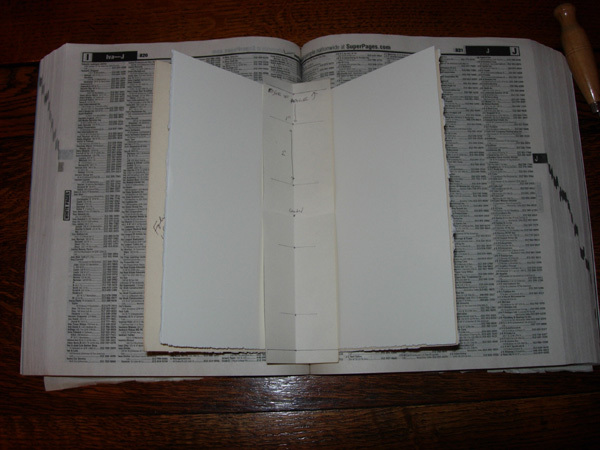 I use our Manhattan phone book as my base (Thank you, Gwenn Diehn). Using the 5 hole guide, I punch all 5 holes in each signature with an awl. I use bookbinder's linen thread and a darning needle originally given to me by Gwen Diehn in an evening workshop where we made 2 signature/pamphlet stitched journals. 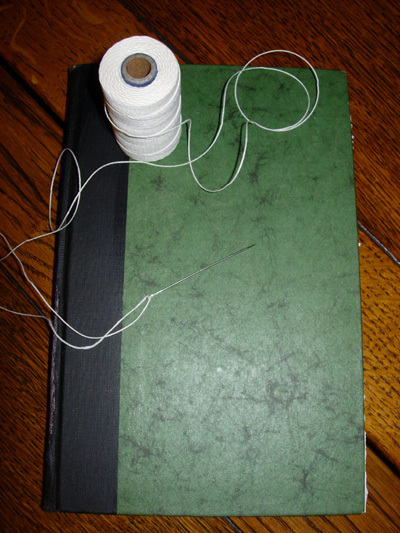 I cut my thread 5 times the height of the book cover plus a little more. In this book I markeded the top of each signature with the letters A-E (for 5 signtaures) in the upper right corner in pencil so I knew that the signature with the title page was added last - and that all pages with writing were in the correct orientation. Martha starts her sewing with "A" so this is really the last signature in your book. "E" is my first signature and gets sewn on last. I follow Martha's stitching method, keeping a printout of those 2 pages in front of me at all times. I use a kettle stitch (also called a half hitch) when passing the thread under the stitches holding the signatures together. In the instructions, these steps begin when attaching the 3rd signature (C) to the 1st and second (A and B). 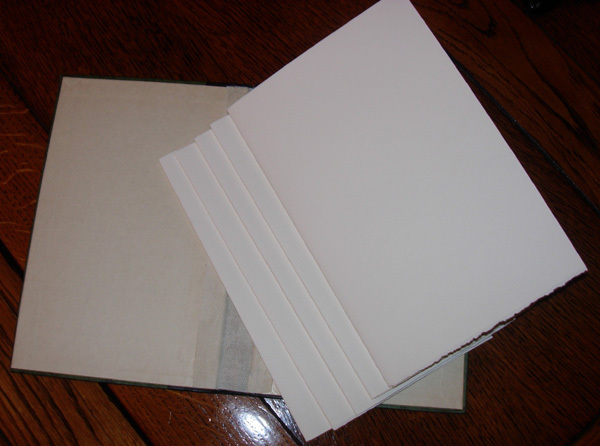 The end papers are glued onto paper block and onto the original book cover to hold the new paper block in the cover. I love selecting end papers that add a little more fun to my finished book. I used a map of Italy for my Michaelangelo sonnet book, a NYC subway map for my NY State Tax report book, and an illustration of the human skeleton for my second figure drawing book. 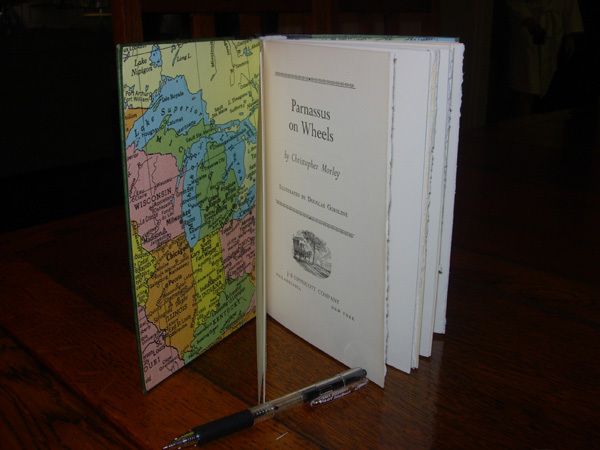 I selected a map of the US for this book because Parnassus on Wheels is a horse drawn "bookmobile" and the major characters set off on an adventure to sell books. All of these papers are available by the sheet in art stores or paper stores. The biggest selection here in NYC is at Kate's Paperie. I use the original folio and my rotary cutter as a pattern to cut the end papers and then fold them in half right sides together. One half of the folio will be glued onto the book cover. 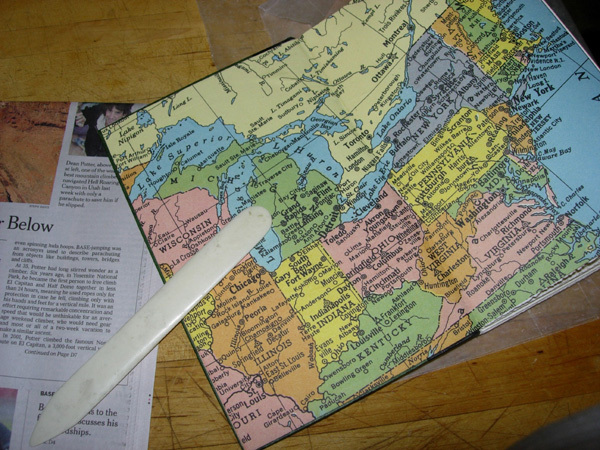 The other half will be glued along the fold edge (approximately 1/2 to 3/4" to the paper block). They must now be glued onto the front and the back of the watercolor block. I use PVA glue and a bookbinder's glue brush - and follow a technique I saw demonstrated by "Paper Source" at a craft show. 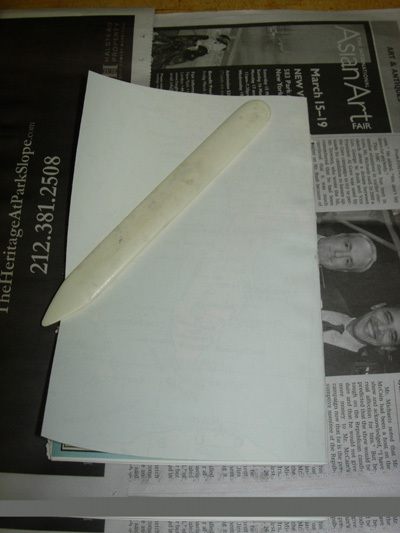 The Method: Lay the fold of the end paper between two sheets of newspaper, allowing 1/2-3/4" of the end paper to be exposed. Soak the glue brush in water and then shake it almost dry. Ihen dip it in the glue and start brushing on glue from the center out - making sure to cover the surface completely. Then glue the fold of the end paper over the edge of the watercolor block - making sure that all designs are oriented in the proper direction. The consistency of the glue is really important and if the brush is too wet, the glue is too thin and it is a mess! Been there and done that! Here is the block after the end paper is attached. At this point I wrap it in wax paper, put it under some heavy books/trays to weight it down and allow the glue to dry overnight. 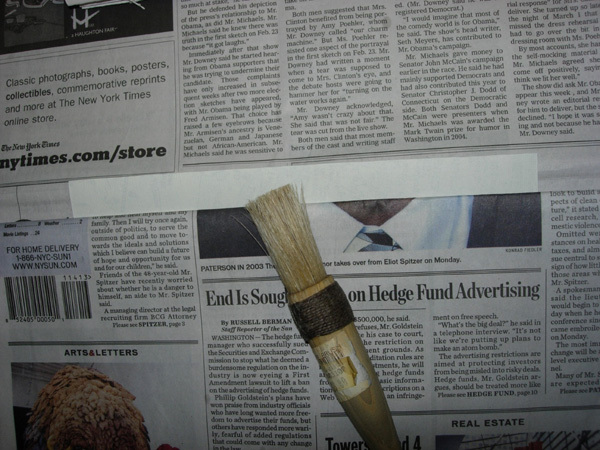 Place a piece of newspaper in the fold of the end paper to protect the watercolor block while applying glue and use the same method to brush on PVA outlined above. Then carefully glue the front and the back end papers to the book cover - positioning them exactly - and then "rubbing" them well with the bone folder to make sure there are no bubbles and that the paper is in contact with every part of the book cover. 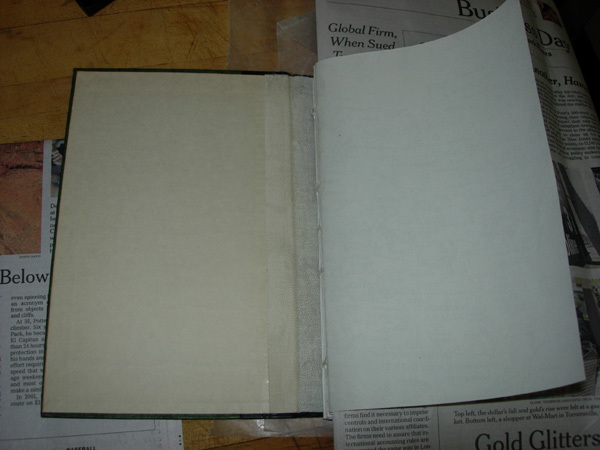 I then wrap the book in wax paper again, weight it, and allow it to dry overnight. 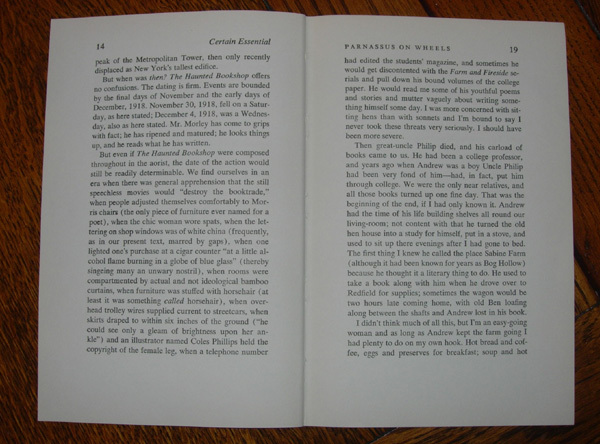 This is what the front and back endpapers looked like in Parnassus on Wheels. Step 6. Covering up the Gaps Between Signatures. I don't like the gaps between the signatures and actually like having strips of the end papers on my watercolor pages. I therefore cut 1 1/2 inch strips of the ends papers and glue them over the gap using the same method of glue application. Here is the gap which I can't prevent with this paper regardless of how much I tighten the thread while stitching. Here is my finished book - with a few of the original pages that I inserted because I love the illustrations. 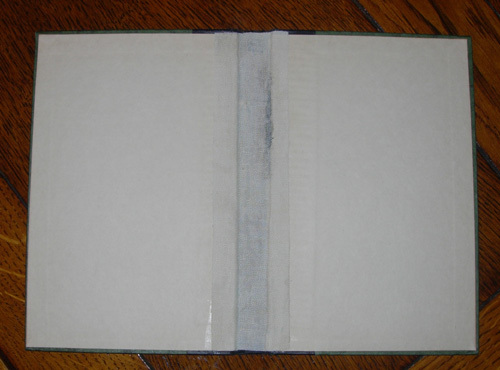 I purchased several bookbinding "how-to" books when I was trying to figure out how to recycle a book inserting watercolor paper. None of them were sufficient by themselves - so I hope that these illustrations are helpful. I have to thank Jan and Martha for being so patient with me and answering all of my questions. What WONDERFUL illustrations and now I may have to try it. It really doesn't look too difficult now. Wow Shirly , what a gift you have given us all to share this procedure in such detail - Thank you so much - I will study this later when I have time and then I am going to make my next journal!! This is really great. thank you for taking the time and the photo to show how you do this. I may just have to give it a go myself. I am a bit of a book nut so I will have to give myself permission to take a book apart. It will be painful, but I am sure it will be shortlived if the results provide one more avenue to enjoy that thing we do with ink, pencil, and paints. Shirley, Thank you so much for taking the time to do this! Good instructions and very helpful. Now I just have to figure out a way to save this information for when I actually have time to give it a try. I'm so glad to have come across your blog and this tutorial today. How cool! I've seen journals done similarly to this but have never seen exactly HOW they are done. very neat! I love them and love the idea of giving new life to old books. I will have to go back and read this a LOT more carefully before I'm ready to try it myself - especially how you stitched the signatures - but I do want to try it at some point. How neat it would be to make one's own journals and sketchbooks! I can't wait! FABULOUS how-to, Shirley!!! Terrific photo shots and instructions!!!!! SUPER SUPER! Fantastic tutorial! So thoughtful. It's interesting how our methods are different and why. I love your books! It is funny how doing this is a leap for some kinds of lovers-of-books and a natural progression for the other kind! Fabulous Shirley...You have quite the patience as well as the talent...and the generosity and good will to share and teach. We all appreciate this so! This is an excellent tutorial. I hate the gaps between the signatures -- I've been able to reduce them somewhat, but not completely. I like the idea of binding in some of the original pages. Your book looks wonderful -- no need to make your own covers, it looks like. Great info -- thanks for sharing! Brava, Shirley. 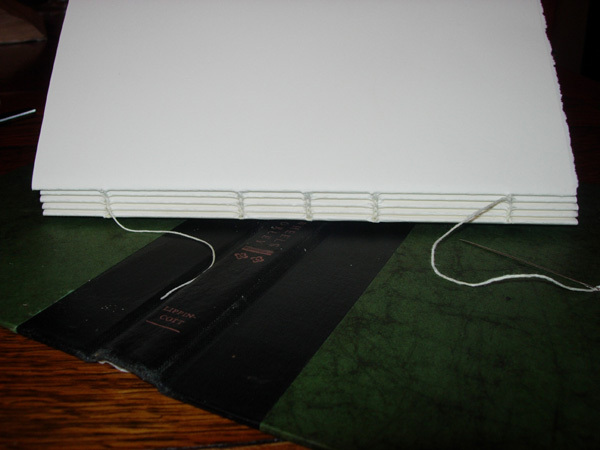 You have done a FANTASTIC job illustrating your bookbinding process. I'm so glad I pressed you to share it because I'm certainly not the only person who is going to benefit from this. I still haven't found my 'book' but I now know where I'm going to look. Can't wait to try this. THANK YOU!!! And just so I'm not so late to get your posts in future, I've finally subscribed to you blog. Thanks for sharing this. I agree with Jan above, that there are so many different ways of binding books, everybody´s methods differs slightly from other´s. I often recycle old book covers like this, and the stitching is exactly the same as the method you use, only I then put the whole text block between two wooden boards and clamp them together, and glue the spine with PVA glue and let dry. I often sew in bands too, before glueing. I never get those gaps between the signatures. But your method seems easier to do, I may have to try it! Thanks again for taking the time to take pics and post everything! beautiful!!!!! I was at the used bookstore the other day and was surprised to find another Art Centers of the World books. 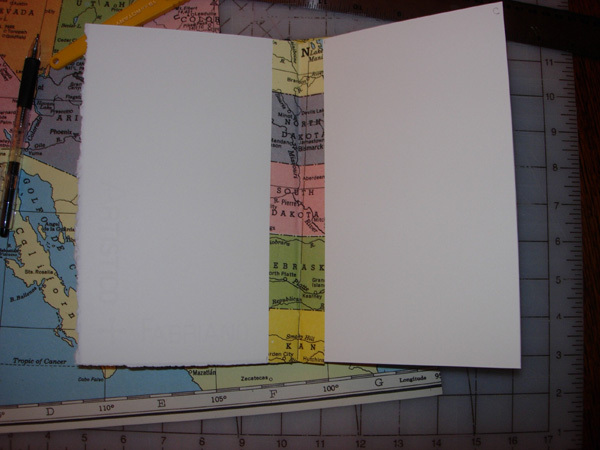 I used the New York one for my first recycled book and this one is Rome. I did an internet search and found I can purchase London and Paris too. I just might and recycle them all into sketchbooks. You did a wonderful job in illustrating this all for us! Have fun with your new book! Wonderful demo, Shirley! Thank you for sharing...I'm going to bookmark this so I can send people here! Great tutorial. I've been using old books to alter and making my journals from scratch. Now I can combine the two. Thank you so much for this. the pictures really help. What a wonderful post - and so well illustrated! This is so wonderful. I would love to try this sometime (well, maybe), so thank you so much for sharing. This is a great tutorial. I've been wanting to make a book with watercolor paper of my chosing, and this gives me hope that I can do it. 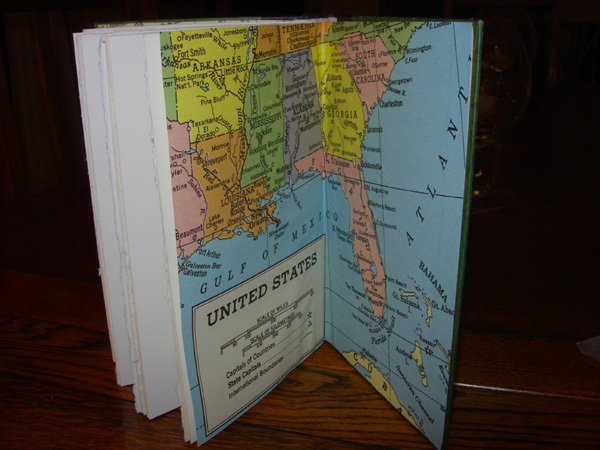 Wonderful tutorial and I love the way you've made the book-binding your own by recycling the book's contents! Thanks for sharing this with us. I may have to try it one day. This is the first time I read directions that made it clear enough for me to attempt. Thank you! Beautifull blog you have, your journal watercolors are excellent! Re using old books as covers for artits journals, it's a brilliant ideia, and I'm shure gone try it. The gaps between signatures are really a problem. 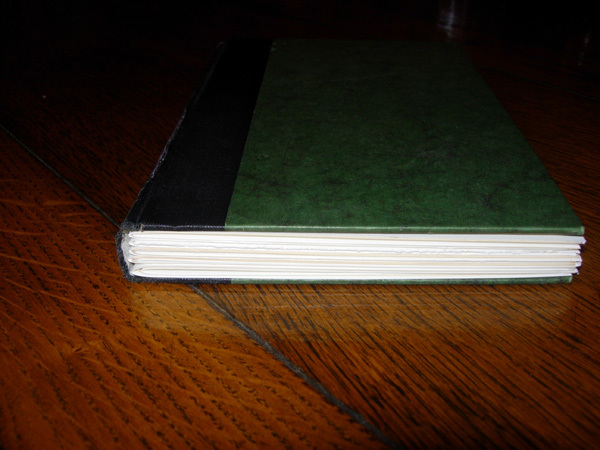 I've done some amateur book binding my self, and it's extremely difficult to eliminate them completely without professional tools (which I don't have either). 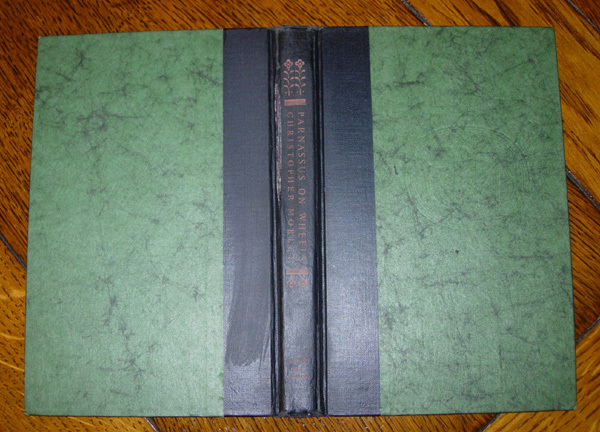 The endpaper strips are a nice and original touch, but if you prefer a more traditional book binding approach, I found that a slightly more complex stitching method improves the results significantly. This is done by stitching around "spine cords", rather than directly around the signatures bends. 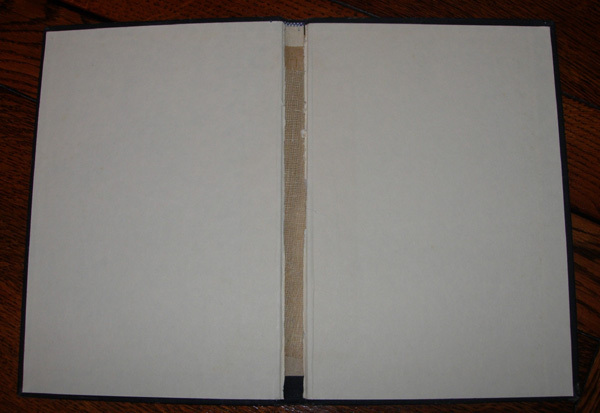 You can see an example of this type of technice at http://www.mothteeth.com/bookmaking/, for example. In this example, fabric or card tapes are used, rather than cords, but you can use waxed wrapping cord as well. If necessary, after stitching you can tigh the signatures more closely together, by carefully pressing them to each other while holding the cords tight. You can then apply PVC glue over the spine, but that may not be even necessary. Oh my goodness. I am so happy I asked if you were willing to have me over! You know this will ruin me! I will want to do just this and and nothing else. I already regret not having all the materials I need. the result is "magnifique". Thank you for such a well documented step by step process. Lovely Shirley, in all respects - thank you!! Thank-You. Finally. Instructions I can understand and follow. Thanks so much! 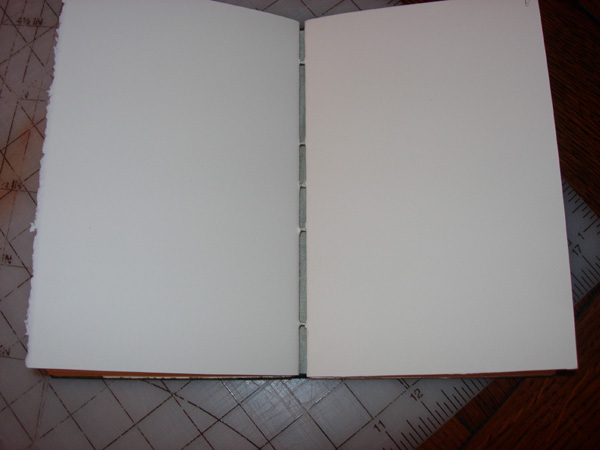 This answers several of my questions of how to bind a book for sketching. Very clear instructions and photos! Lay the chicken pieces skin side down in your baking dish. difficult to imagine the gap in modern life that would have been created had it not been for all the special herbs and spices that have graced succulent pieces of chicken over several decades. in one large single batch and place them on sheet pans for the oven.